DUBAI, United Arab Emirates -- The United Arab Emirates has begun the process of imposing mandatory military service for adult males to add "another layer to the national defence force," the country's prime minister announced Sunday. The move appears aimed at least in part on feeding more Emirati nationals into the federation's armed forces. The UAE military and police forces depend on foreigners to bolster their ranks. Sheik Mohammed bin Rashid Al Maktoum said on his official Twitter feed that male high school graduates between the ages of 18 to 30 will be required to serve nine months, while those without a high school diploma must serve two years under the draft legislation. Military service for female Emiratis would be voluntary. "The new law adds another layer to the national defence force to further protect our nation, secure its borders (and) preserve its achievements," Sheik Mohammed said on his official Twitter feed. In separate comments carried by state news agency WAM, he said "national service implants the values of allegiance, loyalty, discipline and sacrifice among youth." Sheik Mohammed is vice-president and prime minister of the seven-state United Arab Emirates federation as well as the ruler of the emirate of Dubai. The UAE, which sits across the Persian Gulf from Iran, enjoys warm relations with the United States and other Western powers. A relatively young country, it was formed in 1971 after decades under British protection. Its seven semiautonomous sheikdoms have pursued increasingly tighter integration over the years, helped by financial support from the oil-rich capital, Abu Dhabi. The UAE Cabinet has endorsed the draft law, which will now be considered by the Federal National Council, a largely advisory body. Emirati policymaking is dominated by the federal capital Abu Dhabi and the commercial hub of Dubai, and there likely to be little public opposition to the plans in the OPEC member nation. Most of the country's workforce is composed of foreign guest workers, though Emirati leaders have tried to get more nationals into public and private-sector jobs. Theodore Karasik, a security and political affairs analyst at the Dubai-based Institute for Near East and Gulf Military Analysis, said the unexpected initiative could lessen the country's reliance on military personnel from South Asia and other Arab countries. "This did come out of the blue, but for a very good reason. The situation in the country demands manpower ... based solely on Emirati nationals," he said. "In the future, there may be trouble in other countries where those who serve in the armed forces now would need to go home. And that would leave a manpower shortage." The UAE military currently has an estimated 51,000 active-duty personnel, according to the International Institute for Strategic Studies. Much of its military posture is aimed at deterring potential threats from nearby Iran despite longstanding trade and cultural links between the two neighbours. 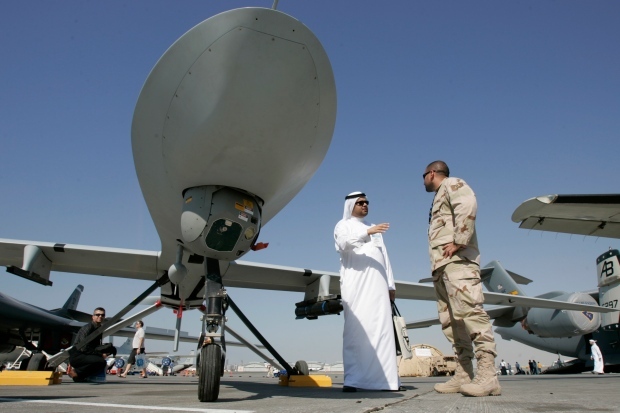 The UAE military also has sent troops overseas, including as part of the NATO-led mission to Afghanistan and to provide humanitarian relief to Pakistan. Karasik said the military conscription policy is unlikely to be directly aimed at bolstering the armed forces to confront threats from nearby Iran, but is rather "purely an Emirati issue." "This helps to bind the country together," he said.